Our Home Smoked Paris Ham is a revelation. This recipe comes from the know-how of our cooks to enhance all the flavors. For lovers of traditional tastes, Smoked Paris Ham is a fantastic bite. Renowned for its generosity, smoky taste and balanced texture this sausage is for Gourmets as much as for Gourmands! In the mouth, it is soft, juicy and particularly supple. Smoked chicken can be enjoyed hot and cold. Its flavor is delicate and smooth in mouth and the smoke gave it the quick it needed. All good things come to those who wait? Aged for month in our cured room and smoked for hours, We’ve created for you a homemade smoked spanish chorizo with a unique deep spicy flavored piece. Cagette has cold smoke these duck breasts for long hours with hickory wood to enhance the deep scents and umami savors. 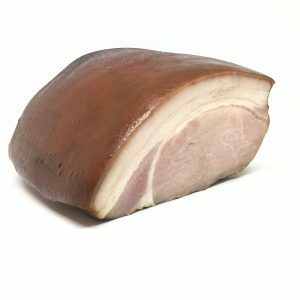 At Cagette we cured these pork belly for several months before smoking it with apple wood. 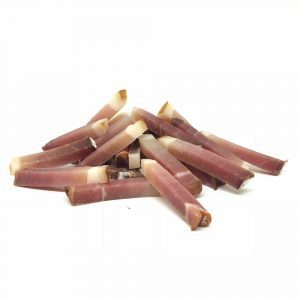 Enhancing its delicate and strong taste, this charcuterie can be enjoyed as an appetizer or as a prepared dish. In French cuisine Lardons is a good value in many dishes, it add texture, flavor, a bit of fat, a salty savor everywhere it is. Our Homemade Smoked Lardons are even better! “The Prince of Paris”. An exceptionally white version made by Cagette. For the pleasure of everyone! 100% natural! This is the juiciest part of ham, and also considered by most its best part. Try our fine selection of Jambonneau! Many possible ways of cooking it for many different sensations. This sausage is homemade and flavored with our spices. A perfect balanced between hot and smooth texture. Great in risotto, Ideal for a spicy sandwich, mandatory for BBQ parties! A delicious and full of surprise mousse, ideal as a starter with toasted bread and a refreshing wine. Cheers! Served cold, it will not fail to warm your heart. Pure taste of terroirs, it?s the best spreading paste the French created. Best match with fresh baguette, pickles and a glass of red wine. Warning: it is highly addictive! If people can let you down, this p?t? won?t. Over the years, duck p?t? crust has become a classic of French gastronomy. Always appreciated, this tasty and savory recipe is still on the menu of the best restaurants! Le Mans is wordly known for his car race but did you know their famous Rillette? This called ?brown pork jam? is a wonder of France in the gastronomy. A smaller version of our traditional Terrine de Campagne. A recent winner of a Good Food award in San Francisco, this p?t? is smooth and spreadable. The drops of Cognac is enhancing its flavor even deeper. 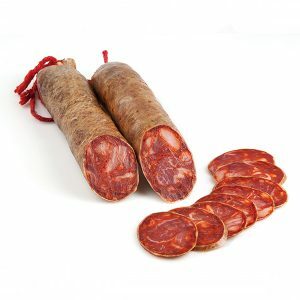 This delicious chorizo is a dry-cured sausage made from the famous Ib?rico pork of Spain. Seasoned with the smoky paprika from western Spain, it has a deep red color and a complex meaty flavor. Slice thinly and serve with fresh bread and a glass of great Spanish wine. 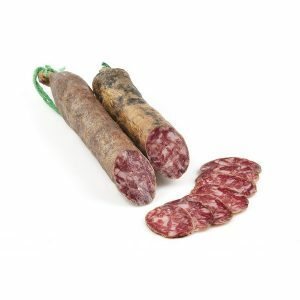 Iberico salchichon sausages are simply seasoned with sea salt and black pepper and hung to cure in the cool mountain air for several weeks in spain. Unlike Iberico chorizo, salchichon sausages are not seasoned with smoked paprika, so the pure spanish Iberico pork flavor shines through in each delicious bite! A p?t? de campagne is the easiest terrine to make, and in the spirit of its origins?a humble but delicious dish made from trimmings or inexpensive cuts of meat?should be made with whatever garnish is on hand and eaten simply, with a good baguette and French Dijon. Add a salad of fresh greens, and you’ve got a simple midweek meal. It’s also a fabulous make-ahead dish for a weekend dinner party. Our homemade Foie Gras terrine recipe is made with a whole lobe of Foie Gras that is slow cooked with Cognac. A must for every occasions!